Fujitsu today announced development of its Fujitsu AI Solution Zinrai Deep Learning System, comprised of a dedicated deep learning server incorporating the latest GPU(1) from U.S.-based NVIDIA Corporation, along with operationally tested storage and software. Sales of the system begin today in Japan. Using this system, customers looking to build a system using deep learning in an on-premises environment can quickly set up a deep learning platform offering world-class speed. In addition, depending on needs, the customer can also easily build a hybrid cloud environment incorporating the Fujitsu Cloud Service K5 Zinrai Platform Service Zinrai Deep Learning, which provides a deep learning platform in the cloud. Given this, it becomes possible to use according to objective, such as by performing learning processing with low usage frequency in the cloud, and learning processing with a high usage frequency in an on premises environment. Going forward, Fujitsu aims to extend the Zinrai Deep Learning System to regions outside Japan, and to further strengthen its solutions to flexibly meet customers' various AI-related needs. In recent years, the use of deep learning, a type of artificial intelligence (AI) machine learning technology, has been expanding, which has resulted in dramatic improvements in AI recognition accuracy, accelerating the development and spread of services using AI. In order to achieve high recognition accuracy using deep learning, however, large volumes of training data need to be processed over and over, creating issues with the significant time and computational resources required. In order to respond to this type of issue, in April 2017, Fujitsu launched Zinrai Deep Learning, which offers a deep learning platform with world-class speed as a cloud service. In addition to that service, Fujitsu has now begun sales of the Zinrai Deep Learning System, which offers a dedicated deep learning server incorporating the latest NVIDIA® Tesla® P100 GPU, along with operationally tested storage and software as a complete system for customers that, for such reasons as preferring to not take data off site, want to build a deep learning platform in an on-premises environment. This system provides a deep learning platform with world-class speed through a dedicated deep learning server employing the latest NVIDIA® Tesla® P100 GPU. 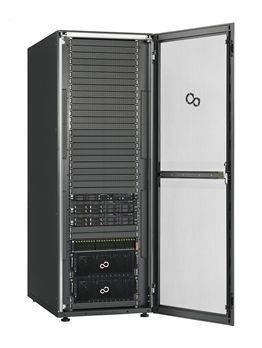 Because up to eight GPUs can be incorporated into a single server, customers have the flexibility to select a system structure based on application and in consideration of Fujitsu's recommended computational capabilities. This system is offered as a complete package, combining a dedicated deep learning server that includes over 100 types of necessary software in a ready-to-use state with operationally tested storage. Customers can therefore quickly build a stable deep learning platform in an on-premises environment. Customers can easily build a hybrid cloud environment by combining the on-premises deep learning platform built with the Zinrai Deep Learning System with the Zinrai Deep Learning cloud service, so that tasks can be flexibly divided based on application. GPU - Graphics processing unit. A processor specialized for processing images. In recent years, it has been applied to problems outside image processing due to its high processing capability.